Content companies are falling behind in the innovation game. One reason the future doesn’t look so bright for many media companies is they stopped inventing it. Of the 1,000 companies that spend the most on R&D, a group scrutinized by PwC’s “Innovation 1000” study last year, only seven fit squarely in the media sector: Sony, Netflix, IAC, Thompson Reuters, Technicolor SA, Pandora, and Sky plc. Over the past few decades, media companies developed some of the most important technology for their business, including the DVD and Blu-ray. (Sony, which helped on both, originally got into the media business partly to influence the market for its technology.) Sony remains the media industry’s top investor in R&D, spending just north of $4 billion in 2016. But the next leap forward in media technology probably won’t come from the world of consumer electronics. Digital innovation usually now involves more software than hardware, a fact driven home by Amazon taking the first and Alphabet second spot on PwC’s list of top R&D spenders. Distribution and data are becoming as important to the media business as content itself. “The leading players are laser-focused on innovating around the user experience,” says Kristina Bennin, a PwC senior director. Media executives might say that they only score so low on spending because PwC’s R&D numbers don’t include investment in content — film development, music production, and the like. When it comes to content, “entertainment and media companies are spending at levels comparable to the Innovation 1000,” Bennin says. That’s backed up by figures from the global information company IHS Technology, which show that the traditional media giants — Disney, NBCUniversal, CBS, Turner, HBO — usually spend on content equal, or above, their tech rivals. These media companies’ names are notably missing from PwC’s R&D list, which cuts off around $100 million. 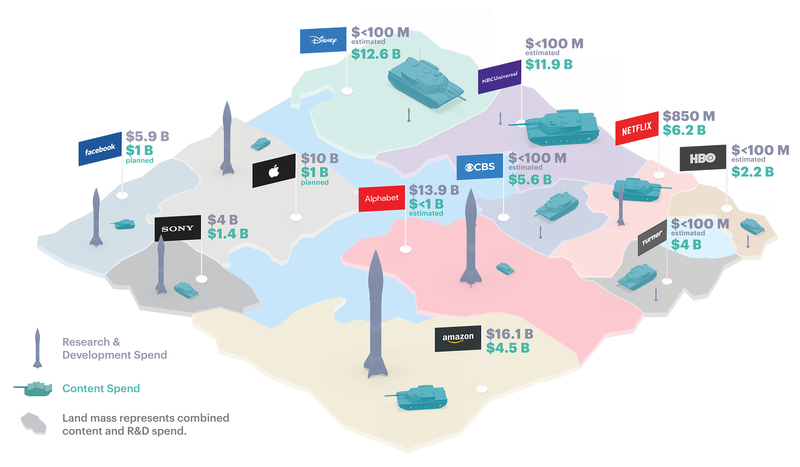 A company like Disney may make significant R&D investments through subsidiaries, especially now that it has a controlling interest in online video streaming company BAMTech, but publicly available documents don’t show R&D investments in the nine figures. Clearly, these media companies aren’t spending on R&D anywhere near the level of Amazon. Meanwhile, tech companies like Amazon and Apple are now investing in content — the former went from spending $2.6 billion in 2015 to $4.4 billion last year on content. Apple and Facebook each announced plans to spend $1 billion on content this year. Media companies tend to invest in projects more than distribution technology. Newspapers spend significantly on the reporting that goes on the front page, but far less on improving the online feel of an A1 story. One notable exception is video game companies, of which there are 15 in the Innovation 1000, including Nintendo, Ubisoft, Activision, and EA. Silicon Valley is winning the game for the future of the media business not so much because they’re unbeatable but because the traditional media business didn’t field a team that plays the same sport. If more media companies begin investing more significantly in R&D, the tech firms in Palo Alto should have a harder time running up the score.